The title says it all! A person experiencing abuse needs to have courage and needs someone to coach and encourage them through the process. A coach helps them be prepared to admit the possibility that they are in an abusive situation and shows them the steps to take toward freedom. 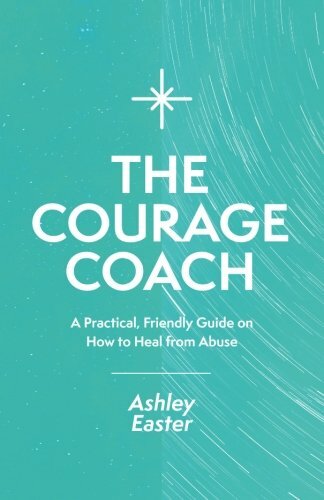 In the author’s own words, “I decided to write this book as a guide for others as they seek safety and as a friend who has gone before to lead the way.” Ashley’s experience was typical of so many people who didn’t recognize an abusive situation, and certainly didn’t know how to break free. She uses her own story to help people in these situations which seem inescapable. With only six chapters, Courage Coach is not an overwhelming amount of information to digest at a time when the reader may be confused, scared, and unsure. The resource list and hotline details at the end are valuable as a place to start toward reaching out to a new life. The author manages to pack such a lot into a few chapters, and writes in such a personable style which makes the reader feel comfortable and understood. This book is intensely practical and answers many questions which a person may not even realize they need to ask. It helps the reader to identify what constitutes abuse in its many forms and complexities. One chapter covers the issue of self-blame. As this is a recurring theme for so many it is a valuable chapter and covered in a sensitive way with many hypothetical questions answered. Another chapter covers what the rights are of an individual who has most probably been denied the liberty of thinking for themselves. This encouragement is surely a relief and opens possibilities a person may not have considered before. The chapter about other people’s responses faces the reality that not everyone will be supportive and offers suggestions on how to cope with various reactions to a person’s disclosure of abuse. It is one thing for a person to be convinced they deserve to be free and quite another to reach out to share what they are learning with the wider world and find out that not everyone understands. The author prepares the reader to cope with adverse reactions and gives examples of what good reactions should be like. Courage is a recurring theme because it certainly takes courage to move toward being the person God designed us to be. Through this book, the author coaches the reader, step by step, to reach out and see the possibility of freedom. I would imagine the chapter contents are similar to the outlines for the Courage Conference run by the author, but the book can stand alone as a handbook for people who are ready to be brave enough to explore what is happening within themselves and to reach out for help.